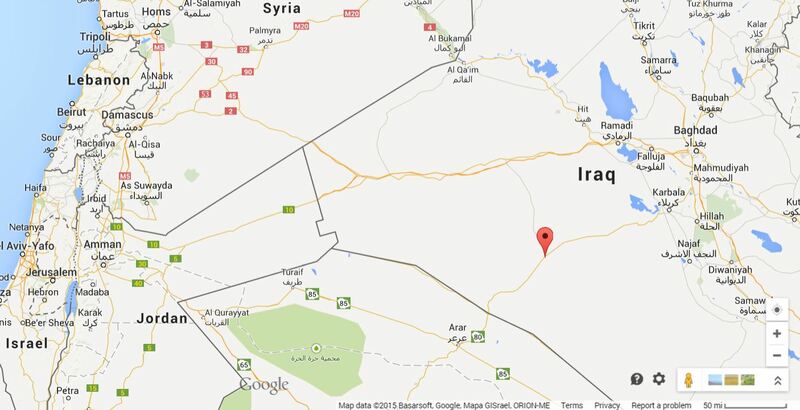 Reuters reports the location of the attack as near the Suweif border station, about 40 km from Arar, Saudi Arabia and 80 km from al-Nukhayb, Iraq (marked by red pin), putting the attack roughly where the road connecting them crosses the border. I’ve long followed events along the porous Pakistan-Iran border area, as there are often events taking place there that have very different descriptions on opposite sides of the border. As recently as December 28, three Iranian IRGC members were killed in the area. This is a departure from the usual pattern, where border guards instead of IRGC are the usual targets. Iran retaliated by firing mortars over the border into Pakistan, who claimed as many as 7 injuries from the attack. Iran is also reporting today that they have arrested a team of “terrorists” south of where the December event took place. Saudi Arabia’s border with Iraq, defended by earth barriers and fences and monitored by camera and radar, has been attacked in the past by mortar bombs fired from a distance, but more targeted strikes are rare. No group immediately claimed responsibility for the assault, which hit a remote desert area next to Iraq’s Anbar province where both the Islamic State militant group and Shi’ite Muslim militias close to Riyadh’s foe Iran operate. Monday’s attackers, described by the ministry only as “terrorist elements”, shot at a border patrol near Arar and when security officers responded, one of the attackers was captured and detonated an explosives belt, the ministry statement on state media said. One of those killed was a senior officer, ministry spokesman Major General Mansour Turki told Reuters. Local media, including al-Arabiya television, named the dead officer as General Oudah al-Belawi, the head of a border sector. A third officer was wounded, the ministry said. The Reuters article quoted above [the quote above is from an earlier version of the article which has since been updated] relied on a single expert to blame the attack on ISIS based on the presence of a suicide bomber. AP, on the other hand, assigned no blame, but noted (as did Reuters), that Saudi Arabia has joined the fight against ISIS in Syria. It will be interesting to see whether any group claims responsibility for the attack and whether there are additional attacks along the Saudi-Iraq border. For now, I’d place about as much authority on the pronouncement that the presence of a suicide bomber means the attack came from ISIS as I do on Iran’s latest “documentation” that the US is controlling ISIS operations out of the embassy in Baghdad. Back on Thursday, I noted that Iran claimed the right to enter Pakistani territory to chase terrorists that it blames for a series of border incidents that have killed a number of Iranian border guards. Iran wasted no time following up on that threat, as on Thursday night Iranian shelling killed one Pakistani soldier. Iran followed that up with border guards entering Pakistani territory on Friday to interrogate a number of villagers. It appears that Iran confiscated a vehicle and other items during the incursion. Diplomatic posturing ensued. “The FC personnel were chasing miscreants when they came under attack by Iranian forces. It was a targeted attack on Pakistani forces,” the spokesperson added. One FC vehicle was completely destroyed due to intense firing by Iranian forces. 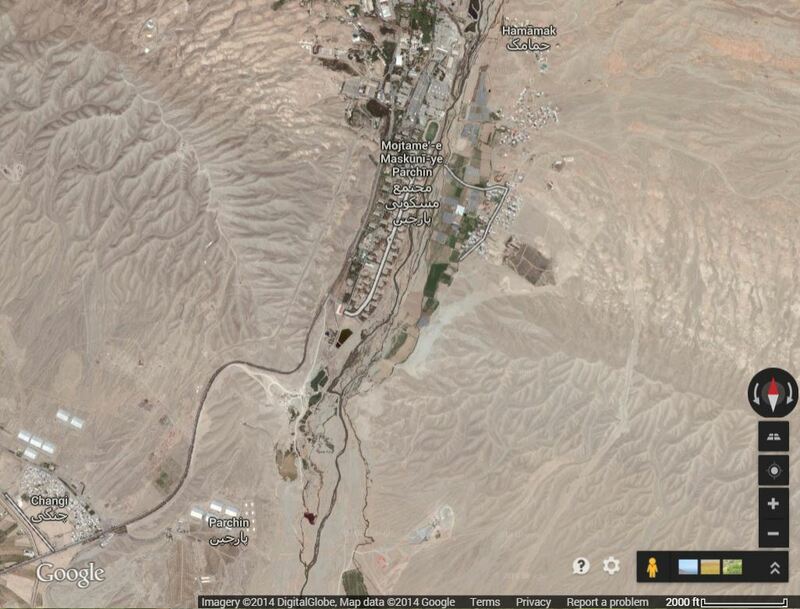 Iranian border guards continued firing for six hours. However, Pakistani forces did not retaliate to the offensive of the neighbouring country. The big question is whether Iran feels that Pakistan’s Frontiers Corps is aiding the groups that cross into Iran or whether the Pakistani forces came under fire in this case through a mistake when they were chasing the same “miscreants” Iran presumably wished to target. There was a small amount of additional cross-border shelling on Saturday that appeared to have no effect. For their part, Iran does not seem to have addressed the events Thursday night through Saturday, although they did put out a statement today praising their strong security in the border region and comparing the terrorist attacks to “mosquito bites”. Iran blamed trans-regional enemies (the Americans and Zionists) as well as unnamed regional enemies for the attacks. In an analysis of the flare-ups in Dawn, we see mention of the Jaish al-Adl group, Iranian concerns about development of the port at Gwadar and the tension caused by the border putting an artificial barrier through the heart of the regional home of the Baloch people. But returning to the point above, it is hard to reconcile the statement from Pakistan that the Frontier Corpsmen who came under fire by Iran while chasing “miscreants” were intentionally targeted. While Iran sees Sunni extremists at the heart of their cross-border attack problems, there would seem to be significant overlap between those groups and the Baloch militants that the Frontiers Corps has long been subject to criticism for human rights abuses while trying to quash said militancy. If Pakistan is indeed serving as a “regional enemy” of Iran in this case and supporting or providing refuge to some of the groups involved in the attacks on Iranian border posts, then Iran would seem to be justified in attacking the FC personnel. The fact that the FC did not return fire would seem to fit that scenario and serve as a tacit admission that they had been caught doing wrong. However, if the FC were chasing a group that intended a cross-border attack, then Iran would be the ones responsible for needless escalation. As I noted in discussing the first reports of the explosion at Parchin, early September saw a larger than usual incident along the Iran-Pakistan border, with a force of over 70 militants and a truck packed with over 1000 pounds of explosives attacking an Iranian border station. Thomas Erdbrink then noted last week that two separate incidents along the border resulted in the deaths of “a senior officer” and “three police officers” in two separate incidents in the same region. Iran will step in to contain terrorists if Pakistan refuses to take measures in order to secure its borders to keep terrorists from slipping into the Islamic Republic, a senior Iranian military commander says. “We believe that every country should respect its commitments vis-à-vis its own internal security as well as that of neighboring countries. Border security is a common and pressing need for neighboring countries. We are, in principle, against intervening in the affairs of any country, but if they fail to abide by their obligations we will have [no choice but] to act,” the second-in-command of the Islamic Revolution Guards Corps (IRGC), Brigadier General Hossein Salami, said on Thursday. “Terrorists, wherever they may be, even on the soil of neighboring countries, we will find them, and if they do not give up acts of terrorism, we will deal with them without reservation,” the senior commander added. Gosh, maybe the US should go to the UN or the ICC to complain about such a blatant violation of Pakistani sovereignty if such an attack takes place. Just as soon as the US stops violating Pakistani sovereignty with drones, that is. The article goes on to quote Salami that Iran has very good intelligence on the terrorist groups in the border region and then notes that “Iranian security forces have apprehended a number of perpetrators behind the recent killings” regarding the incidents described in the Erdbrink report. Gosh, with intelligence that good on the border zone terrorists, maybe Iran will start using drones in Pakistan, too. I can only imagine the chaos that would sow among the chattering classes inside the Beltway. A mysterious explosion at or near an important military complex rocked the Iranian capital on Sunday, lighting up the skies over the city. Iranian official sources denied the explosion had taken place at the complex, the expansive Parchin military site east of the city, where international monitors suspect Iran once tested triggers for potential nuclear weapons. But the enormous orange flash that illuminated Tehran around 11:15 p.m. local time clearly came from that direction, several witnesses said. Officials at Iran’s Defense Industries Organization, though also denying that the explosion took place at Parchin, confirmed that two people were missing after “an ordinary fire” caused by “chemical reactions of flammable material” at an unspecified production unit, according to the semiofficial Iranian Students’ News Agency. There was no word on the location of the fire. Witnesses in the east of Tehran said that windows had been shattered in the vicinity of the military complex and that all trees in a hundred-yard radius of two villages, Changi and Hammamak, had been burned. The villages are on the outskirts of the military site. Google Map of Parchin showing outlying villages of Changi and Hammamak. As seen on the map, Changi is very close to Parchin, but Hammamak is on the other side of Parchin and the two villages are over three miles from one another. A blast fireball that scorched trees over three miles apart must have been quite spectacular. 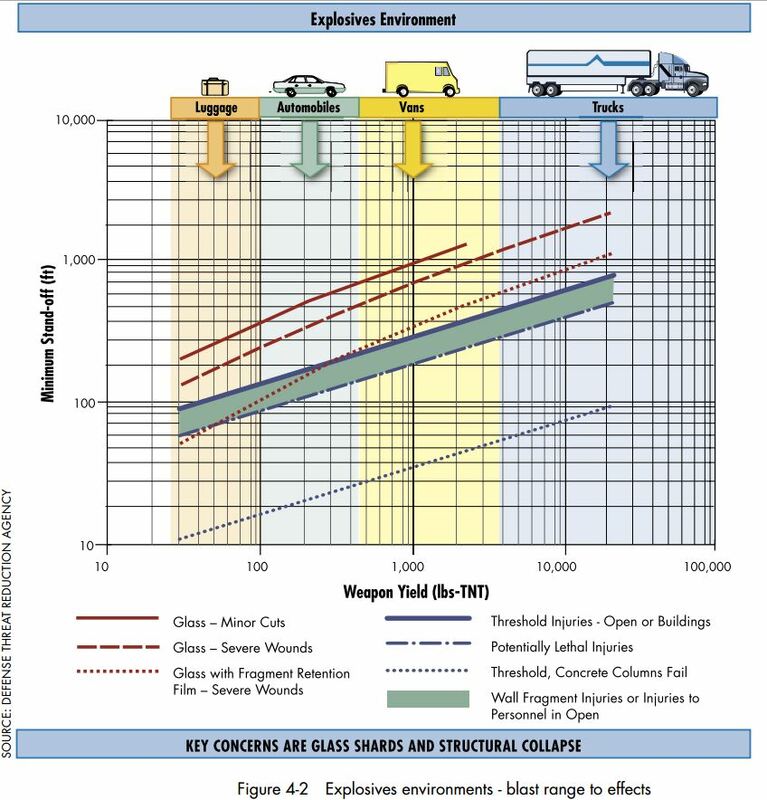 Because it relates to assessing damage from terrorist bombs, the FEMA figure breaks the amounts of explosives down into the amounts that can be carried by cars, vans and large trucks. The Times story doesn’t report on how far away from the complex windows were shattered, but the effect of burned trees in villages over three miles from one another suggests that such damage would reach quite a ways. At the very least, it would appear that the blast had the equivalent of more than 10,000 pounds of TNT, and perhaps significantly more than that. Informed sources in Pakistan confirmed earlier reports that Jeish al-Adl terrorist group has executed one of the five Iranian border guards that it abducted along Iran-Pakistan border on February 6. The sources told FNA in Islamabad on Monday that “Jeish al-Adl has martyred one of the kidnapped border guards”. This is while the Iranian Interior Ministry earlier today rejected Jeish al-Adl’s claim. “We don’t confirm this report; were it true, we would have been informed,” Interior Ministry Spokesman Hossein Ali Amiri said on Monday.He said that the five border guards are kept in Pakistan at present and are safe and sound. Amiri made the remarks after Jeish al-Adl claimed on its tweeter page that it has killed Jamshid Danayeefar, one of the kidnapped border guards. Efforts and consultations with the Pakistani officials still continue to secure the release of the five border guards abducted along Iran-Pakistan border on February 6, an Iranian official announced on Sunday. “Talks with national and local Pakistani officials have been held at different levels and they have made some promises,” Governor-General of Iran’s Southeastern Sistan and Balouchestan province Ali Awsat Hashemi told FNA today. He expressed the hope that the five young border guards would be released to return to their families soon. In the statement following the announcement of his death, Jaish al-Adl demands that if 50 of their prisoners are not released by Iran then Jaish al-Adl will execute another hostage within 10 days. The clock is ticking for the four remaining “pasdar(s)” or guards. In the meantime it seems unlikely that the Iranian government will be able to fulfill or want to meet the demands of Jaish Al-Adl. A regime that does not succumb to threats and ultimatums by the West is unlikely to make a deal with a terrorist group. Jaish al-Adl operates in the Sistan-Baluchistan region of Iran, and frequently utilizes the Iranian-Pakistani border to carry out attacks. Cross border operations have been practiced during the time of Abdolmalek Rigi’s Sunni Balochi group, Jundallah. After Iran executed Rigi in 2010, Jundallah dissolved and merged with Jaish al-Adl. Stay tuned for further developments. With Pakistan still reeling from the Carlotta Gall article the Express Tribune wound up censoring entirely because of its revelations of ISI sheltering bin Laden, they risk displaying more evidence of collaboration with terrorists if they are unable to secure the release of the remaining border guards before the next one is executed. Recall that back in October, near the town of Saravan in southeastern Iran, 14 Iranian border guards were killed by attackers who had infiltrated from the adjacent border with Pakistan. Iran retaliated very quickly, executing 16 prisoners the next day. A previously unknown group, Jaish al-Adl, claimed responsibility and has since been described as a radical Sunni Wahhabi group with ties to Jundallah. Lieutenant Commander of Iran’s Border Guard Force Brigadier General Ahmad Garavand vowed tough battle against any kind of terrorist move along the country’s borders, and said the border guards have repelled tens of terrorist attacks against the country. After the attack the Islamic Revolution Guards Corps (IRGC) in a statement vowed to take action against. The Quds Forces of the Islamic Revolution Guards Corps (IRGC) released the two hostages that had been taken by a group of outlaws in Southeastern Iran yesterday. On Monday night a group of bandits took two Iranian citizens hostage in the city of Iranshahr in the Sistan and Balouchestan province. Some hours later in early Tuesday morning, the captured civilians were released in an IRGC surprise operation which left three bandits dead and 3 others injured.